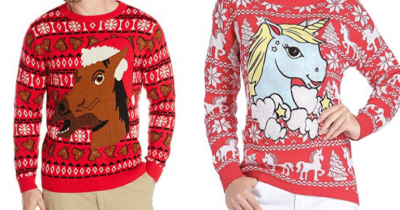 When it comes to Ugly Christmas Sweaters, the tackier the better. 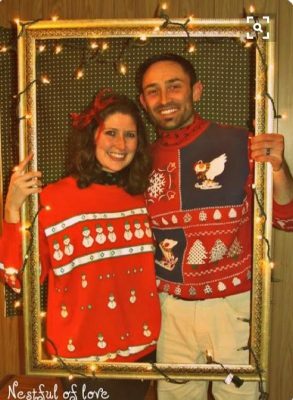 And if you’re thinking of throwing an Ugly Christmas Sweater Party, you’ve got to go all-out gagworthy (in a good way). 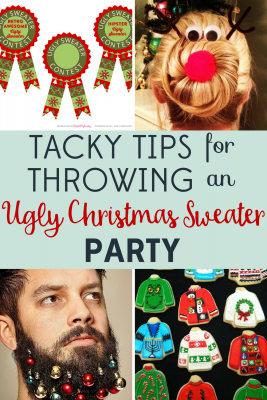 Here are some ways to assure your Ugly Sweater Party is delightfully hideous. Think beyond the sweater. 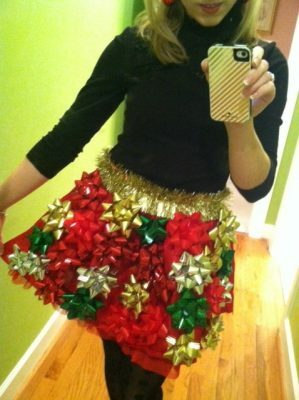 If you’re a woman, you can add to your festive look with a skirt of bows, like this ghastly creation found on the Something Delightful Blog. Says blogger Rachel Timmerman, “I found the perfect red polka dot taffeta skirt in the girls’ section (of Target), the gold garland for the sash of the skirt, and a package of present bows all in a matter of minutes.” She put the skirt together with a hot glue gun. Don’t forget your hair. Sure, you can always wear a Santa hat, but why not go for something really gaudy? 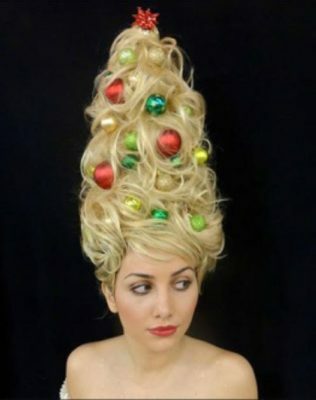 Want your hair as high as a Christmas tree? Try this idea found on Inventor Spot. “Start with a cheap foam tree form and then pin your hair to the form using spiral hair pins which should help lock your hair in place.” Up the tacky factor by spraying your hair with green, washable hair dye. 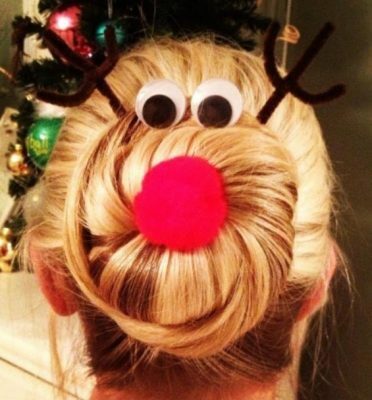 For the Rudolph the Red Nose Hair Bun, start with a hair donut which I was able to find at my local dollar store. Adorn with pipe cleaners, googly eyes and a red pom-pom. Guys – join in by accessorizing your beard! 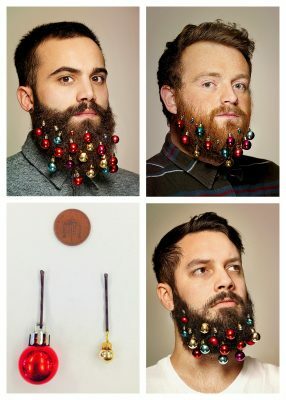 DIY your own beard baubles using dollar store mini-ornaments and bobby pins. Holiday snackage is a must. 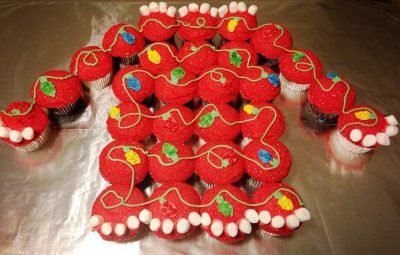 Whip up this Ugly Christmas Tree cupcake fiasco with instructions found on Purple Chocolat Home. Eat, drink and be tacky! 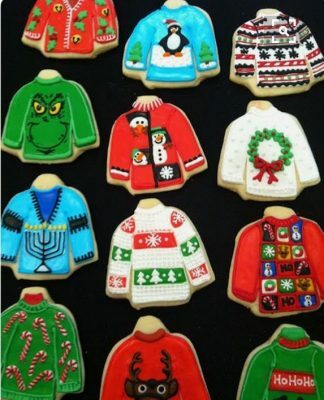 Pop sugar has “A Guide to Making the Cutest Ugly Christmas Sweater Cookies.” Not as talented as whoever made these cookies? Don’t worry – a Fail would be even better! If you don’t want to make them from scratch, check Trader Joe’s for their Ugly Sweater Christmas Cookie decorating kit. Tacky gift exchange. Ask guests to bring a gag gift (emphasis on “gag”) for the gift exchange. No item over $5, thrift store finds encouraged. Insist that gifts be intentionally bad. Then have a “Yankee Swap” where guests must vie for their favorite gift. Don’t forget the music. You can find Ugly Christmas Sweater Party Playlists on Spotify and YouTube. 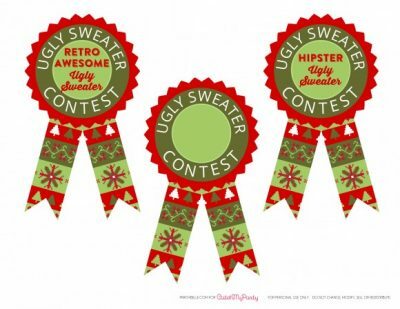 Give awards for the worst Ugly Sweater. Guests can drop their vote for Ugliest Sweater into a wrapped gift box with a slit on top. You’ll find these free printable awards, along with free printable party invitations at Catch My Party. Wisdom Panel Dog DNA Test Only $54.47!